You need to justify every cent you spend on marketing. If you want to reach online merchants of all sizes, there is no smarter place to advertise than EcommerceBytes. 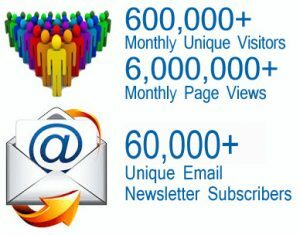 EcommerceBytes’ two email newsletters have a larger audience (60,000+ unique subscribers) than any other publication in this industry. 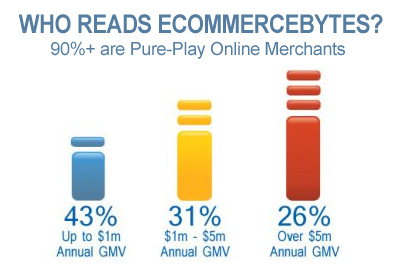 EcommerceBytes newsletters have industry-leading open and click thru rates at 42% and 45% respectively. Our opt-in subscriber list is pristine, with less than .01% bounce rate. You could advertise your service in an industry publication that has fewer subscribers, and pay much more. You could be one of several ads within an email newsletter, competing with other services – in EcommerceBytes newsletters, you are the sole sponsor. Our web site burns over 6 million banner impressions monthly. Because many of our readers come to the site through search engines, feeds, social media and other channels, we recommend advertisers reinforce their message with banner advertising. Our newsletter campaigns include 200×200 banner rotation on our site. We offer 970×250, 728×90 and 300×600 banners as well as exclusive interstitial campaigns. Why take your ad spend to a place that charges over 3x our banner rates? The reason that our readership is so loyal and EcommerceBytes sponsorships are so effective is because our subscribers know that they are receiving original content that will help them in their business. Our readers look forward to reading EcommerceBytes, and they know each and every article contains high quality, original content. We reach more online sellers than any other industry trade publication. Effectiveness. When you advertise with EcommerceBytes, we’ll work directly with you to craft your message so that it resonates with our readers. Flexibility. Change out your banner as often as you’d like during your campaigns, to coincide with your promotions, webinars and other events. We can change out your creative within 24 hours. Accountability. We provide real-time banner reporting that you can access from your personal administration page. We will put your service in front of a highly-targeted audience of online merchants interested in services which will enhance their businesses. Shop around and compare our rates and reach with other publications. We’re confident you’ll get more for your advertising dollars right here. Contact me via email at dsteiner@ecommercebytes.com or give me a call at 508-655-5697. EcommerceBytes publishes two email newsletters covering ecommerce, online payment services, Internet marketing and online-auction industry issues. The EcommerceBytes web site is stocked with resources and archived articles that keep over 600,000 monthly site visitors informed and educated.